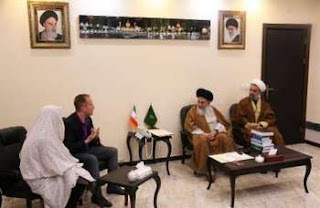 Shiraz (Iran) - A young Dutch Christian has converted to Islam and became Shia Muslim in presence of Ayatollah Seyed Ali Asghar Dastgheib, the grand custodian of the Holy Shrine of Ahmadi and Muhammadi. Ayatollah Dastgheib said Islam is an ever lasting and permanent religion and Quran is a book superior to the Gospel and Torah. He said Torah and Gospel have been distorted throughout history but Holy Quran is the original divine words and ever lasting despite passage of centuries. Noting that any person claiming Islam might be or not to be Islam. He added that Takfiri and Daesh terrorist groups claim that their acts and crimes are inspired by Islam, the truth is that are telling lie. The reality of Islam should be found in its main patterns, including the school of thought of the Great Prophet Mohammad (PBUH) and his infallible household as well as his followers. Meanwhile, the Dutch Muslim said he had been encouraged by Muslims in his country to travel to Muslim countries like Iran to find out realities and truth of Islam. He said two years ago he visited Iran and since then his ideas on Islam and Muslims changed, realizing that Shia Muslims are kinder than followers of other Islamic schools of thought. Asked why he preferred Islam, he said when he was a Christian he was not a committed individual but having seen unity among Muslims and having visited Iran and seeing lifestyle of of Muslims, especially Shia Muslims, he felt peace of mind and interested in Islam. Since start of the new year of 1395, three people have converted to Islam in Shahcheragh and in presence of Ayatollah Dastgheib. Based on a related report, visiting Imam Reza Holy Shrine (AS), an Ethiopian lady converted to Islam and became a Shia Muslim. Getting familiar with principles of Islam, accepting the oneness of God, prophecy of Prophet Muhammad (PBUH), as well as confessing to the Velayat of Ali (AS), Almaz Mardas converted to Islam and became a Shia Muslim. Director of Non-Iranian Pilgrims' Affairs of Imam Reza (AS) Holy Shrine Javad Hasheminejad quoted Mrs. Mardas as saying that she converted to Islam because it is based on reasonable principles. Hasheminejad told IRNA that various non-Iranian pilgrims including 10 European and American citizens have been converted to Islam in the Holy shrine in the past Iranian year (ended March 19, 2016). Several non-Muslims converted to Islam in recent days. For instance, a German and a Swiss student converted to Islam from Christianity in separate ceremonies held in Shahcheragh Holy Shrine in Shiraz.